The leaves are starting to show their fiery colors, there’s a refreshing chill in the air, and pumpkin spice abounds. In all its glory, fall is finally here. And what better way to celebrate the beginning of the season than to pick the perfect pumpkin? In no particular order, here are our favorite places to pick pumpkins in the state. Hellerick’s Family Farm has no shortage of pumpkins for picking during the autumn months. In fact, they have so many that they’ll even lend you a wheelbarrow to transport your haul! Also: on Friday and Saturday evenings from 7-10 p.m., you can even pick your own pumpkins out by flashlight. Talk about an autumn adventure! Pick a pumpkin “most weekends” in October at None Such Farm in Buckingham. Don’t leave before checking out the Pumpkin Festival, either—it's free! Sip on some hot cider and check out the following attractions: hay rides, pony rides, a train ride for tots, and corn stalk tunnel, to name a few. Opening in mid-September each year, Grim’s orchard offers apple picking, pumpkin picking, a petting zoo, hayrides, and more. The pick-your-own orchard at Grim’s grows more than 20 different types of apples and has plenty of PYO and pre-picked pumpkins available for purchase, too. Enjoy the petting zoo, hayrides, and other fun activities on weekends for a small admission fee. Fall treats like apple cider donuts, pumpkin ice cream, and apple pie are also available. Fall weekends bring festivities to many farms in PA, but at Cheeseman Farm, they bring the Cheeseman Pumpkin Festival. Festivalgoers can pick out their own pumpkins for only cents per pound, take hayrides, and pet animals at the petting zoo. Be sure to stick around after sunset for the Cheeseman Fright Farm, which features haunted activities and attractions for an admission fee. Lancaster’s own Country Barn Market features a 10-acre pumpkin patch for all of your pick-your-own pumpkin needs on Fridays, Saturdays, and Sundays in October. Climb aboard the wagon and take a hayride out to the pumpkin patch to find your perfect pick. At this Berks County farm, visitors can pick their own pumpkins, pears, and apples, among other fruits. In addition to picking opportunities aplenty, Frecon Farms also features a farm market, bakery, and cidery, where alcoholic cider is produced using the farm’s own fruit. Visit the farm of a weekend, and you’ll be able to enjoy live music, scrumptious seasonal eats and treats, and more. Pick your own pumpkin at Cherry Crest Farm during the fall months, while enjoying entertainment in the form of music, magic, demonstrations, and pig races. And when Halloween passes, be sure to come back to the farm for its Pumpkin Madness Festival, where you can destroy pumpkins in a wide variety of ways. Adults and children alike: who doesn’t love a bit of destruction every now and then? Looking to keep everyone in the family entertained on a crisp fall day? Head over to Sissons’ Pumpkin Patch and you won’t be disappointed! Here, there are hay rides, pumpkin slingshots, an obstacle course, slides, and a ton more fun to be had. If you work up an appetite or need a refreshment, Sissons’ has you covered with food and drinks too. 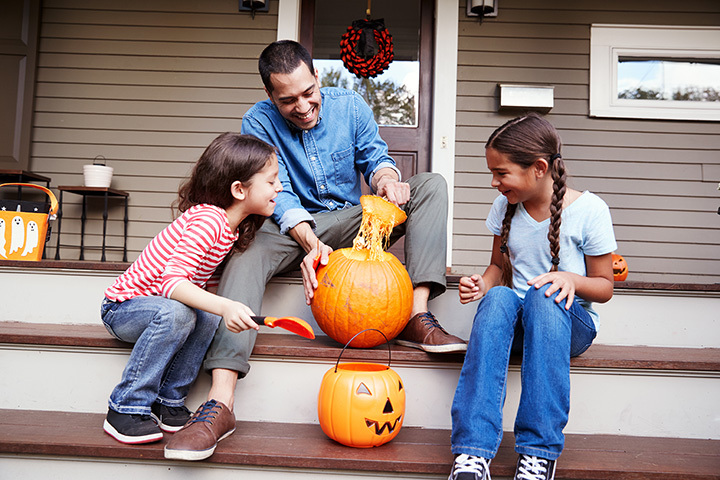 Pick your own pumpkin(s) and then rent a fire pit—you can stay until sun goes down! Without a doubt, Linvilla Orchards is one of the most popular farms offering PYO fruit and veg in the region. Pumpkinland at Linvilla Orchards features hundreds of pumpkins in all kinds of shapes and sizes, as well as PYO fall apples, live music, rides, face painting, seasonal snacks, and so much more. Don’t miss the jack-o-lantern exhibit at dusk, either. It’s fun for kids and adults! Visit Maylath Farm & Orchard for a fun day for the whole family. Take a hayride out to the pumpkin patch and find your favorite pumpkin. Then, check out the corn cannon and the apple slingshot. The kids can take a pony ride, pet animals at the petting zoo, play in the grass, or wander around the corn maze. For more fun fall attractions, check out the farm’s website.